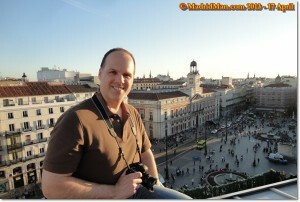 Last week I had the distinct pleasure of enjoying some INCREDIBLE views from a Madrid rooftop – IN THE PUERTA DEL SOL! Madrid’s Puerta del Sol, 17 April 2013. Sometimes I think to myself, “I really am blessed to have such good friends and good contacts.” My new-ish Madrid buddy Nacho Gil, of “Callejeando Madrid“, is an impressive photographer hobbyist and seems to have more (rooftop) contacts than the Prime Minister of Spain. This time he brought me along. I’d been begging (read: nagging) Nacho to let me tag-along for one of his Madrid rooftop photo shoots and he finally relented. Maybe it was just good timing or maybe because he knows well my affinity towards Madrid’s Puerta del Sol. In any case, he gave me an photographic experience of a lifetime. We met at the Oso y el Madroño statue at 7:45pm last Wednesday under a super-sunny clear sky; a perfect day for taking pictures. I would’ve preferred a few thin, wispy cirrus clouds on the horizon for character, but when appointments are made, you must make the best of the time you’ve been given. So that’s what we did. Nacho and I then met his contacts in the northeast corner building of the plaza. 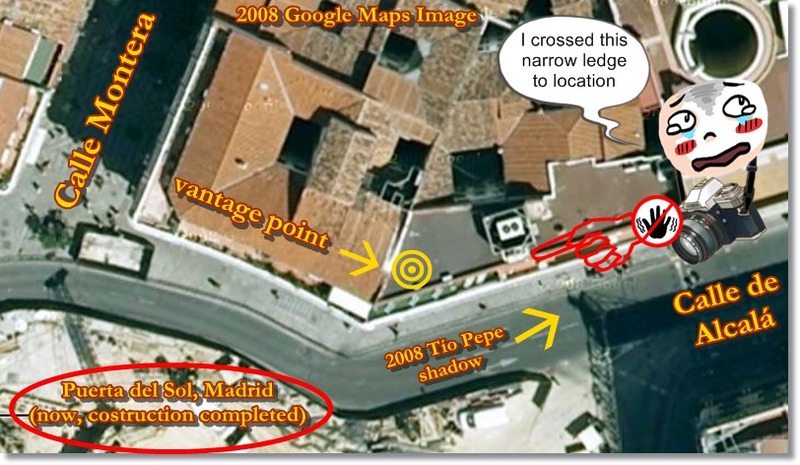 For reference, this is the building immediately left of the Old Hotel Paris and the would-be flagship Apple Store which held up the iconic “Tío Pepe” sign for more than 75 years. After the obligatory handshakes and smalltalk, we were accompanied up to the fifth floor by elevator. From there we took the “secret passage” up a very tight wooden spiral staircase barely thicker than my own body. Good thing I’m not claustrophobic! Since I was the last to go up, I was asked to bolt the door behind me before going up. ‘THUNK!’ Door securely bolted behind me. Oh, my! As I exited onto the wide-open, flat-top roof I could swear angels were singing as the afternoon sun hit my face. But the temporary euphoria was smacked-down by a heavenly hand when I saw what was next. Taking a deep breath – and last in line (smart, eh?! ), I quickly shuffled along the length of the ledge with my camera bag held tightly to my body. Maybe I’m making this all sound worse than it was. To my inside I had a knee-height compressor and pipes. To my outside – and about 15-feet down, I had the terrace below me. Past that terrace, well, you know, was hot asphalt and unforgiving stone. Given the choices, I leaned towards the compressor while completing the distance. Now it’s just after 8pm and we have the entire plaza of Madrid’s Puerta del Sol at our feet. What a view. What a privileged view. With the sun in our eyes and the plaza dark below by contrast there’s not much to do. The only things we can see clearly are to our left and behind us, buildings with sun-shining façades. These include the some-day/year/millennium flagship Puerta del Sol Madrid Apple Store, now totally gutted and with a new roof where the “Tío Pepe” sign is sorely missed by millions. A little to the right and on the near-distant horizon one can clearly see the red brick tower of the Parroquia de Santa Cruz. More to right and on the plaza Puerta del Sol is the clock and bell tower of the Real Casa de Correos, the regional Madrid government building, standing tall in the afternoon sun. Looking due west, nearly into the sun, we can see the dome of Madrid’s Almudena Cathedral. And just below the nearly setting sun we can just make out the foothills to the Sierra Guadarrama mountains. To the right of the setting sun, we can make out the tops of the FNAC and Telefónica buildings. As the sun goes behind the Capital City buildings we can see the typically busy Puerta del Sol better and better. This plaza NEVER sleeps – especially in good weather, and today is no exception. Bicycle stunts are performed to an animated crowd. Human statues are standing/leaning/hoisted motionless at an fiscally agreeable distance between each one. The ever-present, yellow-faced Sponge Bob is dancing around with that big, goofy grin. There’s also the police van parked up against the horse-riding statue of King Carlos III in case citizens or tourists have security issues in Madrid’s “home of the pick-pockets”. Today, fortunately, there are no Mariachis entertaining us, making unaware travelers think theirs is indigenous music to Spain. (Imagine you’re there now…) It’s just after 9pm and there goes the sun. The plaza’s street lamps are turned on and the two fountains and all building façades are now illuminated, glowing. The horizon still has a warm, cozy allure, but it’s fading fast. The yellow turns to orange and the orange turns to pale blue. The stars have tossed back their daytime blankets and are waking up, beginning to twinkle. (You’re still there…) Now it’s 9:20pm and we’ve reached twilight, “La Hora Azul” (“The Blue Hour”), the fleeting span of time during which the sky isn’t yet dark but no longer light. It’s that moment of the evening when you hug your sweetheart a little tighter because you feel some natural, inexplicable energy in the world. It’s also the perfect hour of the evening for photography. It’s now when you have a rich, gorgeous sky while still having a slightly light landscape. Nacho, nickname for “Ignacio“, and I were up on that Puerta del Sol rooftop for nearly two hours and we each took dozens of photos, the majority of those during this valuable and brief “Hora Azul“. Having a tripod is a necessity during this critical time because the best, richest photos require a slower exposure and a camera’s movement becomes a photo’s death sentence, quickly and easily deleted. Shortly before 10pm we were packed up and ready to go back down – but FIRST we had to cross over “The Ledge of Doom“! The ledge gained its name since the sun went down, leaving it nearly dark and with far fewer reference points needed for balance. Oh, my! So I leaned harder on the compressor, making Nacho’s contact wince a bit, thinking I might damage the thing. Truth is, it did buckle just a bit with the added pressure I was putting on it, but only lasted a couple seconds so presumably it was fine. Knock on wood. Back down the narrow, spiral staircase to the fifth floor and took the elevator to the building’s front door. After saying goodbye to Nacho’s contact, we stepped out onto solid ground of the Puerta del Sol with the “Oso y el Madroño” statue immediately in front of us. We then said our own goodbyes and parted ways – until the next time he’d let me tag along for more rooftop photo-ops. Thanks again, Nacho! A final note: It should be mentioned that the rooftop I visited is not open to the public nor is easily accessible. 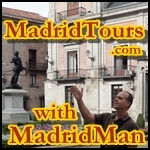 En Español: Lee este blog en versión española en PuertaDelSol.net, “Desde una Azotea de Puerta del Sol Madrid“, aunque es bastante distinto, está escrito en mis propias palabras. 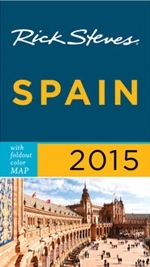 This entry was posted in About Spain, Photos and tagged azotea, Casa de Correos, hora azul, horizon, Madrid, observation deck, Oso y el Madroño, Plaza, Puerta del Sol, rooftop, rooftop views, sundown, sunset, twilight, Views. Bookmark the permalink. Muchísimas gracias, Said. Me alegro mucho que te haya gustado el blog. What a treat and all around great experience! Nacho Gil’s photos are fantastic. And I love your photo – just above the last one – of the haphazard roof tiles. Thanks, Wendy! It was one of those once-in-a-lifetime experiences, yes. (at least to THIS point in my life) Just to clarify for my readers, all the photos posted in my blog are my own work. But yes, Nacho Gil’s own photos are fantastic. He’s a professional amateur photographer! You are a great photographer ! I loved that you included the video panorama of ‘Sol’ so that I could orientate myself better. The description of “La Hora Azul” was perfect. Awww, shucks, ma’am! I’m a fair photographer at best, but I appreciate the praise anyway. I really still can’t believe I was up there. What a great opportunity. great shots indeed MM, these are the pictures that will last because of the unique spot not so many can get to. Thanks for sharing it.